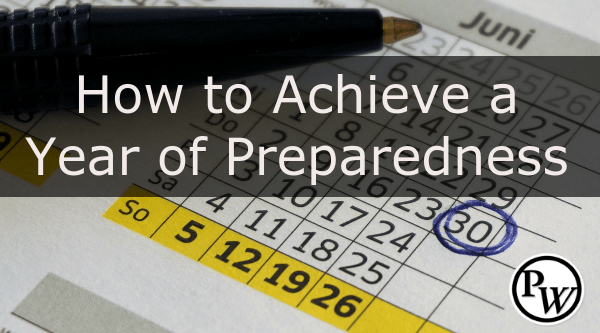 How to Achieve a Year of Preparedness! Don't Prep on Accident! 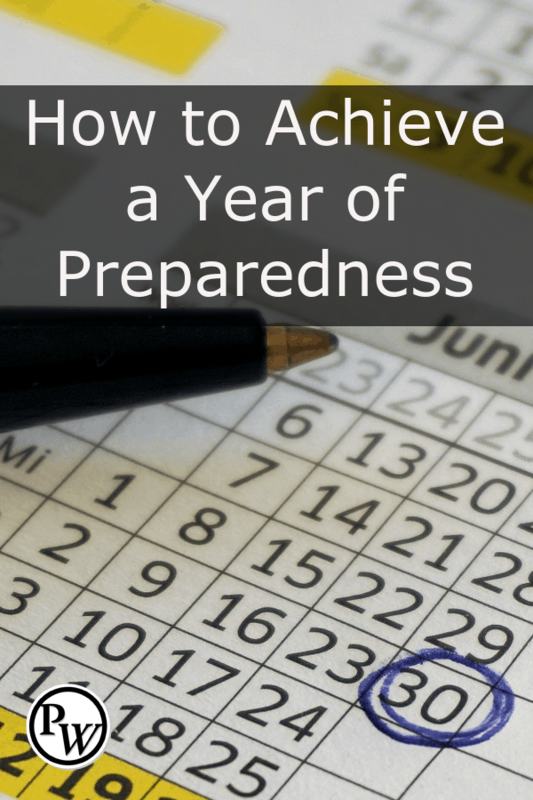 Have you achieved one year of preparedness? We all believe in preparedness. If you didn’t, you wouldn’t be reading this article right now. But, we should also want to make sure we’re moving forward with our preparedness. We don’t want to stay stagnant. You don’t want to get a couple of items and put them in your pantry or our closets and think that we’re going to be okay. We want to make sure that we are getting more and more prepared every day. It’s important to move from where we are in our preparedness journey and take it to the next step. If you are not purposeful in how you’re preparing, then you’re going to bounce around from day to day and month to month. Before you know it, days have turned into months, months have turned to years. You might have a little bit of preparedness, some skills here, some gear there. 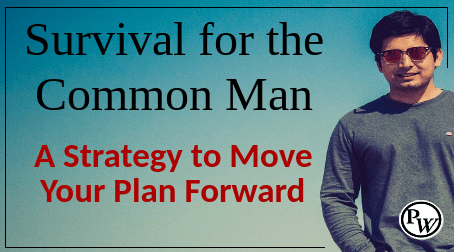 You’ll have a little bit of this and a little bit of that, but you wouldn’t have moved forward in big, actionable movements to get you where you want to be in your preparedness. This article is going to discuss being a little bit more purposeful in your preparedness. I want to give you a couple of ideas of where to go. Remember, we all want to get better prepared. We don’t want to stay where we are! In order to move forward in our preparedness, let’s look at three important questions. Are you working a preparedness plan? Do you have a goal of where you want to be in a year? When most preppers come into preparedness, they usually have a freakout moment. I don’t know if you’ve had that freakout moment, but I know that I did! When we get into preparedness we often start bouncing around and realize that this world we live in is very fragile. You begin to worry. And if we’re going to be honest, there is fear that sets in when you realize how fragile our world is. You may even start panicking. I remember when I first started prepping, I would walk into a grocery store and thank God I had a list of things to get. I was often on autopilot and in a daze thinking about how I needed this to be prepared or I needed that to be prepared. You may have experienced something like this as well. If we don’t get ourselves out of that mode, if we don’t start becoming strategic and purposeful, we are always going to just be gathering supplies here and there. We need to have goals! I like to think about goals in a one-year perspective. Where do you want to be in your preparedness in one year? Your goals need to be very realistic. For example, when you think about one year of preparedness, food storage is very important. You might want to have one year of food storage, but I wouldn’t suggest it. I would have a smaller goal to focus on, especially starting out. Again, one year of food storage it’s doable. But I would recommend smaller goals. You need to be purposeful about it. You need to be realistic. So back to the one year of food storage example. It’s a big goal, but let’s just say that it’s doable for someone. However, I like to be more realistic. I like to break it down into chunks. As I get older, time rolls by. I look back and I realize I’ve been prepping for a while. The years add up. So, we can chunk that first year into three months. After one year of preparedness, you want to have three months of food storage. That is very doable and very realistic. That is a good goal to have. You may want to have three months’ worth of food, or so many gallons of water, or an emergency fund with three months’ worth of expenses. You may want to learn a new skill every month. These goals are doable and very realistic. What if you want to be a pro bushcrafter? That’s not realistic. Could you do that? Yes, you could do it. Could you learn a lot? Yes, you could learn a whole lot. But it’s not realistic. We need to chunk it so that we can meet our goals in one year. If you have three months of food, you are more prepared than most people. You are likely in the top 1% of the population. If you can build on that goal every year you would be doing great. Have a goal that’s realistic. And be specific. A word of warning – you could throw a lot of money into preparing. You would have a lot of things in place. You could be better prepared as far as food and materials and gear. But in my opinion, you don’t want to throw in a bunch of money, buy a bunch of stuff, and then put it in a closet and think you’re prepared. That could lead to a false sense of security. However, if you’re like most of us, you don’t have a lot of money to throw into preparedness to become instantly prepared. So, you need to have goals! Do you have a plan for your one year of preparedness? You need to have a plan! Even though you have a goal, it will be considered pie-in-the-sky if you don’t have a plan to work through those goals. You need to have a plan! One thing that you should do when you start planning is to write it down. Write down that you want to have three months worth of food storage in one year. When you write it down, you can see it and it becomes real for you. As you continue with your plan, write down specifics about it. Start breaking it down. You may not be able to get three months worth of food storage in the first month, but you have twelve months to work at it. What could you do? Maybe you could add a week’s worth of food storage every month. At the end of a year, you would have three months worth of food storage in your pantry. Again, write it down and be very specific! Write down the amounts and the money you can devote to your goal. Decide if you would like to spend $25 per month or $100 per month on your food storage. Maybe you have $50 per month you would like to spend on acquiring new skills. With that $50 per month you could buy books, or a membership to something to allow you to watch preparedness videos online. Whatever it may be, be very specific about the amounts and the price. It will help provide parameters for your goals. Can Others Work Your Plan? You want your plan to reach a point where if you couldn’t work the plan for a month (like you become bedridden), you would be able to hand it over to someone such as a family member and ask them to work it for you. Make it easy for them. They will know to go to the grocery store and buy five cans of this and three cans of that and a bag of rice and a bag of beans. They will know to take it home and put it in this container or that container. When you have your plan laid out, you won’t have to spend so much energy trying to figure it all out and putting it all together. You might want to try giving your plan to someone and ask them if the plan is clear to them. Find out if they could work your plan if you didn’t tell them anything else about it or spend any more time with them. Find out if they could work your plan by themselves and become better prepared. Are You Accountable for One Year of Preparedness? Lastly, do you have someone you can be accountable to for your one year of preparedness? You need to be accountable if you’re going to succeed! Accountability is important and there are at least two ways you can do it. The first way is to have someone in your life that you’re able to bounce ideas off of and share your plan. You might be able to find a preparedness buddy and share your plans. Check in with each other during scheduled times to find out if you both have worked your preparedness plan like if you both bought the food storage for this month or this week. Find out if your buddy bought his five cans of green beans! If your buddy says they were able to work their plan this week, then great. If not, when will they do it? Decide to check back in. That’s the typical form of accountability to have in place. It’s powerful when you know you’re going to be accountable to someone else! The second type of accountability is with yourself. I know there are a lot of preppers out there that feel like they’re completely alone. They are prepping on their own. If you don’t have a preparedness buddy, check in with yourself. Set a calendar appointment, an alarm, or an email that reminds you. For example, set a time on Saturday mornings at 8 am. After you wake up and have your first cup of coffee, review your plan and make sure you’re holding yourself accountable. Make sure you’re working your plan and that you’ve done what you needed to do. If you haven’t worked your plan, then make arrangements to get it done. One Year of Preparedness Is Important! These three aspects of preparedness are important. You need to set goals, have a plan written down and put in place that is simple enough that anyone can understand it and roll with it if they need to. And, you need to be accountable to someone else or to yourself and have a time set aside to stop to reflect on whether you’ve met those goals. This is how you don’t prep on accident! You don’t find yourself at the end of one year wondering what you’ve really done! This is a three-step plan for becoming better prepared in one year. If you’re looking for more information on planning, you can check out the Prepper Website Tag Cloud.